So, one of my friends got these really cute reusable lunch bags for Christmas; I thought about them a bit, admired them, probably even remarked that I’d like to make some someday. Then, I hopped on one of my favorite craft blogs, and looked to the sidebar…and there, right there, was a step-by-step reusable snack bag tutorial! And oh, how I LOVE photo, step-by-step tutorials. I’m a slow sewer who usually makes multiple mistakes, but this was foolproof even for me. I did both in probably 2 hours, with the second only taking about 20 minutes. They’re lined, with velcro at the top, and ended up measuring about 6″ across and 5″ deep. 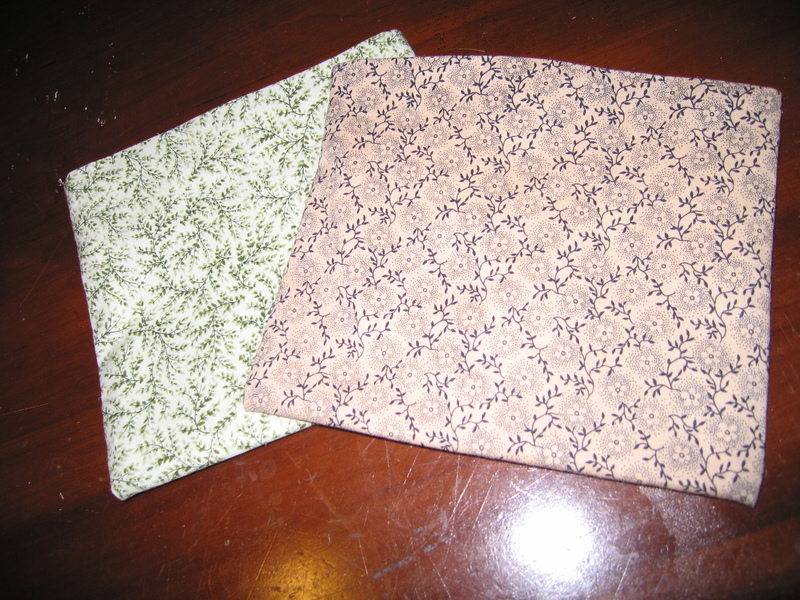 1) she just has a better fabric–more home decor weight, which eliminated the need for a lining, while I used scraps of muslin for the lining, and leftover cotton for the exteriors. 2) I like the thinner velcro strip. This one that I used is just bulky. But for quick & easy…these take the cake. Now I just have to figure out what type of dry food I’d actually put in them…I think slices of bread are on the docket for tomorrow. However much I use them though, I’m glad to think of saving plastic baggies…one of my frugal peeves. I’m the type that washes them out to reuse them, so having some cloth, washable ones, I’m hoping will save me at least one box of baggies a year…maybe I should keep count. Or not. And that’s what Works For Me. To say that I shop at CVS is a vast understatement; I’m there not only snagging deals (though not as often of late), but I also pick up my prescriptions and satisfy any 11-PM Combos & Doritos needs there. I also journal, and thus, generally TRY to be aware of my surroundings; female safety and all that also comes into play. So when I learned that there was a minute clinic in my CVS, my first thought was ‘Where? In the chairs by the pharmacy?” Only after some extensive visualization did I remember a door to the side with a computer in front of it. I don’t know what I thought it was–a store room or something–but when I re-played my CVS in my head, that was the only location that made sense. I’ve been coughing. Coughing so badly that I’ve been to the point of throwing up. Coughing so badly that I decided to take TWO doses of Nyquil, knowing full well that taking 1 ml over the recommended dose ONCE a night, makes me throw up the next morning. I decided throwing up (which I did indeed) was worth getting an extra few hours of sleep. I went to CVS at 5 AM one night to get some Robitussin DM Max for Adults the next night. It did nothing. My husband and I had been blaming it on the dry air, but this was getting ridiculous. We got a humidifier. No change. So I called my doctor, and was told they couldn’t give me any prescriptions over the phone, and oh, the earliest appointment was 5 days away. I nearly cried. A clinic? Hm. It was worth a shot! And once I found MinuteClinic, and learned that there was one INSIDE MY CVS, well, the decision was made. So I signed in on the big, 32″ computer-screen station that I’d totally ignored, right under the big “minute clinic” sign I’d totally ignored, and was placed at No. 5 on the list. Each person seen for a “visit” takes about 20 minutes; if they come for a “shot” it’s generally about 10 minutes. So 50 minutes later, I’m in what I thought was a storeroom…and greeting My. Old. Doctor. So, automatic good assurance of quality care–she was my favorite doctor (or rather, RN, technically, I think) too! My insurance was accepted just fine (I called ahead to check; even if it wasn’t, it’s $62.00 for a illness visit); she listened to my symptoms, took my blood pressure, temperature, and listened to my heart & breathing, felt lymph nodes or neck swelling or something. She gave me a diagnosis of acute bronchitis, and I walked out with an inhaler, daytime and nighttime cough medicines, and antibiotics. Now, I’d read that some doctors had criticized minute clinics for over-prescribing antibiotics, but she fully explained why I needed them, and explained their benefits…and besides, she was my old doctor! MinuteClinic doctors are also ONLY allowed to prescribe what the computer spits out…an extra safeguard, I assume. Thus was my weekend, and the next few days at work, saved from much agony. I’m sleeping now, I’m feeling better, and I not only paid just as little as I would with the doctor, it saved me money by allowing me to go after work, instead of having to take time off, and was definitely quicker. So, I’m now a believer in MinuteClinics, and would highly recommend them if you’ve got a common condition and can’t get to your doctor for some reason. And that’s what worked for me! See more WFMW @ We Are That Family. A mere few days ago, my sister-in-law gave us our Christmas present (Since she flew out with her 3-year-old from Seattle, and then there was the snow storm to keep us all apart even longer). 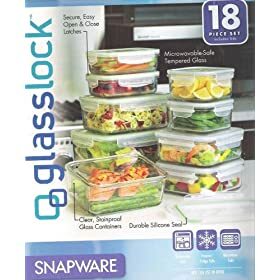 Glasslock Snapware. And I Love It. Love it, Love it. Before, we had been using a combination of recycled containers from all those family-run Italian joints around and 2 packs of leaky flat tupperware, plus about 4 bowls with maybe 3 lids. We needed something different, and I admit my mind had been running on whatever brand those commercials show everything locking and stacking, as we DO have a serious problem with tupperware falling on our heads, and then into a sink full of dirty dishes. Much hatred ensued. But these–no leeching worries in the back of my mind. And the lids LOCK–I had really, really soupy gravy with my pot roast, and even though I dumped it over, no spillage. Now, they don’t really stack, and while I don’t want plastic falling on my head, I certainly don’t want glass falling on my head–some of the smaller ones can fit in the larger ones, but not in a particularly neat & organized way, especially with the 4-flap lids involved and the fact that while it’s convenient to have 2 identically sized containers, they don’t fit in each other, and then what can you do? (Yes, that is a run on sentence). But, I love the clinking of glass, and OH, they HEAT FASTER. And when you’re as busy at work as I am-or at least all your coworkers are sitting & eating and you’re STILL waiting for that food to heat up-this is a decided bonus. So, that’s my entirely unbought recommendation, and that’s what works for me. WFMW: Switching up the Shopping Strategies! I generally am a once-or-twice a month stock-up person. There are some weeks where the deals aren’t so great, and others when I’m just too tired to go out. Lately, I’ve been HORRIBLE at even going out once a month (I attribute some of that to getting behind on clipping coupons), but it has led to some interesting finds on my part. For example, I HATE shopping without coupons, and even now, I won’t buy something if I know there’s a coupon out there. Just can’t do it. BUT, all those Tightwad Gazette readers who like their generic brands just fine? That works too! A bit ago, I decided we needed more than milk, bread, eggs, & butter, so I shopped. Sans coupons. And…it worked out about the same. Yes, I didn’t get the “brands” that I normally would, but we really didn’t notice a difference with the exception of cereal. And now I know, should I need to buy food without coupons, I can. It certainly won’t be a long-term strategy for me…I love the “free” deals, I love getting higher-priced items for pennies, and I like expensive Sour Cream, but it’s sort of released me from the complicated shopping lists that I generally enjoy concocting, but that can sometimes get in the way during busy periods. Also, newly discovered: when I do the once or twice a month shops, I plan out meals. And rotate meals. And get sick of meals. And more often than not, end up eating out when the cupboards aren’t bare, but merely boring. Recently? I’ve been going French-style. And unfortunately I don’t have a cute little market on my direct (walking) route home from work, but we all know we have Market Basket! So, I’ve been stopping every night, spending anywhere from $5.00 to $19.00, and picking up ingredients for 2 meals, max. I get the ingredients for supper that night, and sometimes lunch if there won’t be enough leftovers. And it’s completely reinvigorated my cooking somehow. Even though it eats up 30 minutes in driving/parking/shopping/waiting in line/getting back on the highway. But I’m getting excited for new recipes, I’m loving incorporating multiple–NEW–elements into my meals, and we’re eating different food for once. And this is certainly not a long-term strategy either, as it’s not that cost effective money-wise or time-and-gas wise…but it could be during those weeks when we’d normally eat out every night shovel down pasta and eat chicken for the millionth time. Thus I’m thankful that even though I can sometimes still feel behind…I’m really furthering my frugal life education! And that works for me.